We hold specialization in the supplying and retailing of premium quality Wristband Pen Drives at nominal market prices. These pen drives are precisely manufactured by our vendors using quality tested plastics under the strict supervision of expert team. 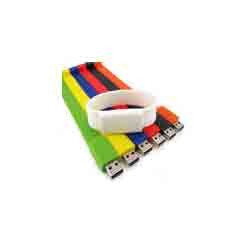 Offered pen drives are attached with attractive wrist bands in multiple colors. Known for their glossy finish, portable design and optimum storage, these are widely demanded by the clients. We are engaged in the supplying and retailing of optimum quality Aluminium Box to our prestigious clients. Looking for Wristband Pen Drives ?